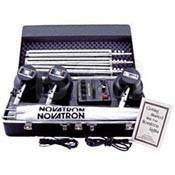 This complete Novatron 63V4003C 3 Head Kit provides a maximum of 400 watt/seconds of stored power. The Heart of the Novatron system is the power supply. It's function is to take AC line power and store it in a bank of capacitors. This stored energy can be discharged quickly and intensely through one or more flasheads. Novatron packs are extremely small for the amount of power they store. The flash heads have built in reflectors, umbrella mounts and tilt adjusters. The 2140C Lamphead contains the controls to operate at full power or to ratio the power and modeling light down up to 2 f/stops from full power. The 2110C head has 1 stop control. Completing the kit are 2 soft silver umbrellas, 3 light stands to support the heads, and a compact, soft padded nylon case for easy storage or transport. Power level is infinitely adjustable at the power pack up to 3 f/stops. Low sync voltage is compatible with all digital and film cameras. Use a Key, Fill, Back, and Hair light with only one power supply. Durable metal housing of the power pack can really take a beating. Novatron's equipment is ideal for those photographers who want to be creative, but don't need bells and whistles. Modeling lights are easily replaceable; 100W - 120V, standard Edison Base Bulbs are ideally found at B&H, or any houseware store, in an emergency. The flash heads feature an integrated tilt mechanism for continuous tilting for stand or suspension mounting. The umbrellas are 45" white, for softening and broadening the light output. The kit case has been redesigned. It is now a soft, padded nylon case. Damage will result if you use this head with a D1500 Power Supply @ full power. This action would also void the warranty. At least one head must be set at full power. If flashtube fails during 1 year warranty period, return entire head to Novatron for replacement. After warranty expires, an entire head must be purchased.